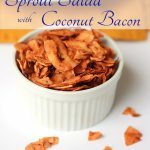 I’ve been eating loads of salad lately and one of my favorites and easiest to put together is Sprout Salad with Coconut Bacon. 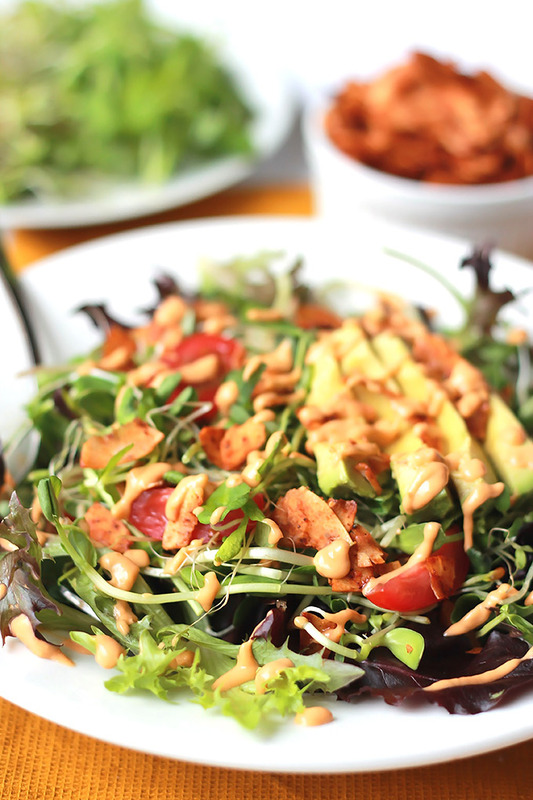 This salad is packed with nutrients and flavor. Pea, onion, daikon, mung and alfalfa sprouts on a bed of spring salad mix. 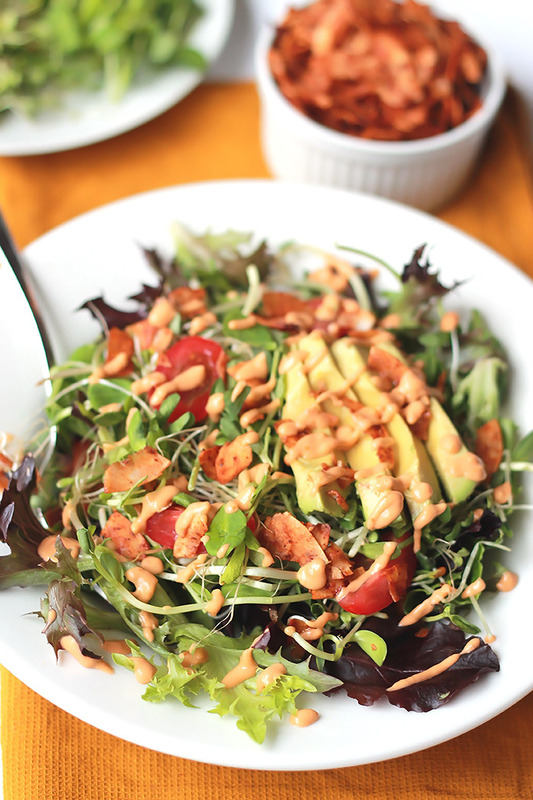 But the star of this salad for me is the Coconut Bacon, I had heard of it, but had never given it a try. While shopping in Whole Foods, I saw a bag of it on the shelf, after reading the ingredients, decided I could make it myself,instead of paying a boat load of money for a 2 ounces. Yeah, it’s not bacon, but a really good replacement. Wow, this stuff is so good! It was so hard for me not to eat the whole pan before putting on my salad. 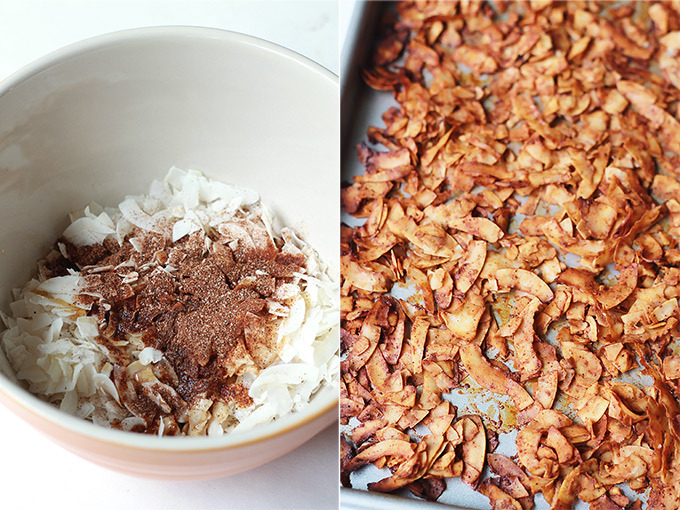 Just mix, spread and bake–12 to 15 minutes later you’ll have yourself some tasty Coconut Bacon. Crispy, smokey goodness, sprinkled over a bed of crisp salad. For the dressing, I simply mixed one avocado with a few grape tomatoes and fresh lime juice. 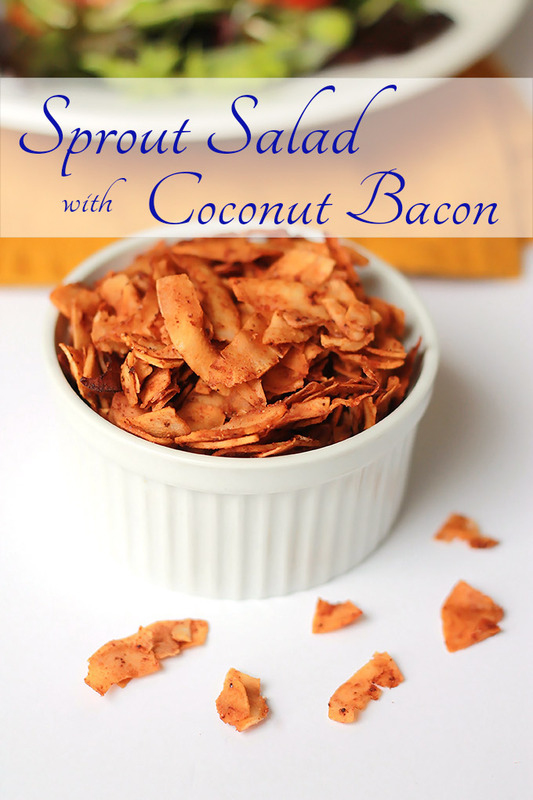 I added them to my salad, but you can add to any dish where you normally use bacon, even BLT’s! 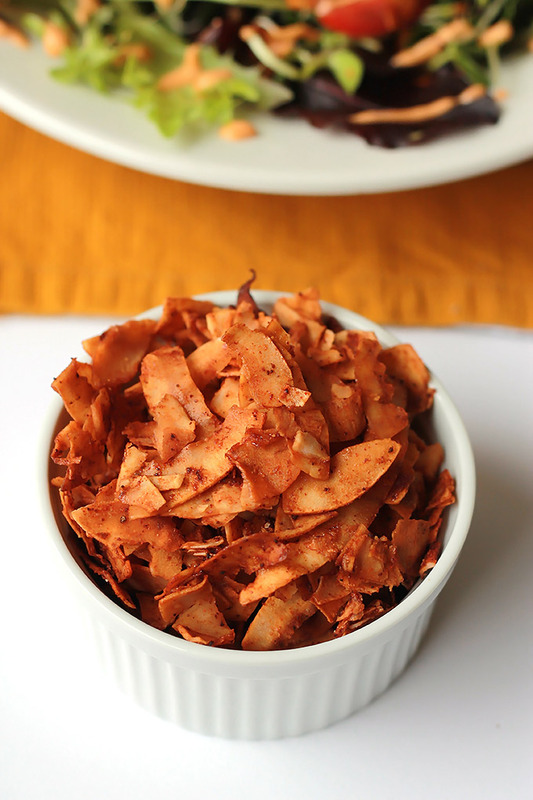 Place coconut chips in a large bowl. Add the remaining ingredients to the bowl, using clean hands, toss to coat all of the coconut chips. Transfer to baking pan and spread into an even layer. Bake for 12 to15 minutes, tossing the coconut chips after 7 minutes. 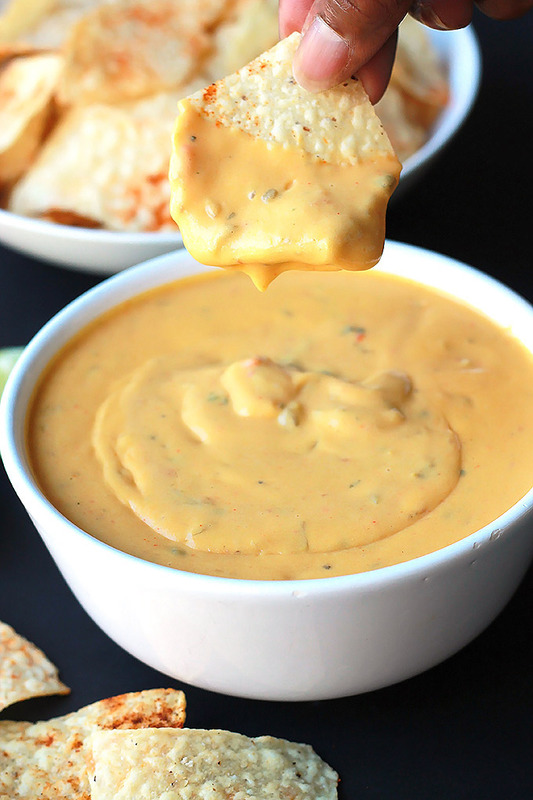 Continue to bake for another 5 to 8 minutes or until chips are golden brown. Take if from me, watch very closely to avoid burning, my first batch didn’t make it. Remove from oven, allow to cool, it will crisp up as it cools. If you have any leftovers of the bacon, just store in airtight container or freeze for later use. Wash salad and spin in salad spinner. Divide the bagged salad onto four plates or bowls. Wash sprouts and spin to dry. Put 1/2 cup of each sprout on top of greens. Slice tomatoes and add to salad. Slice two avocados in half, seed and slice each half and place on salad. Prepare dressing, slice and seed last avocado. Place avocado, tomatoes and juice of two limes in blender and blend until smooth, add more juice as needed to get a smooth pourable dressing. Salt to taste, store any leftovers in the fridge and use within a week. Sprinkle on Coconut Bacon, drizzle with dressing.